You will receive 3 live healthy small sized B52 Giant Venus Flytrap Plants. B52 is a giant clone that makes traps 1.75 inches across when fully grown. It is one of the largest, if not the largest, giant Venus Flytrap clones. B52s are all the same plant. They are all genetically identical. Your B52s come with a 3 inch net pot, moss appropriate for carnivorous plant soil loosely packed, and a full page detailed caresheet, written by an experienced Venus Flytrap grower specifically designed for beginners, explaining how to take care of Venus Flytraps. All you will need is a bowl or saucer to hold the Venus Flytraps' pot that it comes with and a little bit of water, a gallon or so of reverse osmosis or distilled water, and a sunny window or a place in the yard to put your Venus Flytraps' pot in. Humidity domes and year round warm weather are not necessary. Don't be fooled by other offers for Venus Flytraps that have them arrive in or with terrariums or humidity domes. These type of plants have strong light requirements and it is a myth that they need high humidity. The truth is that Venus Flytrap setups with terrariums or humidity domes almost always cause these types of plants to eventually die. They need to be grown in open air with containers that allow air to get into their soil and there should be little to block or diffuse their lighting. Venus Flytraps take about 2-3 years from seed to reach a decent size. 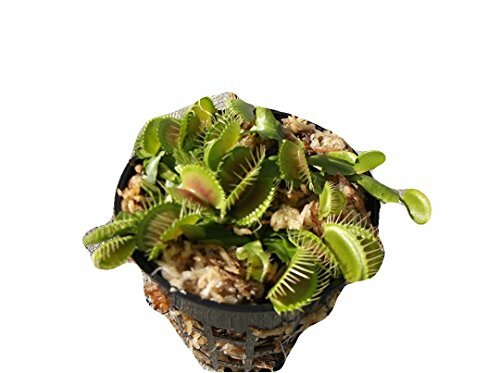 A kit with Venus Flytrap seeds is not going to quickly turn into a Venus Flytrap about the size of the one offered in this listing. A beginner new to Venus Flytraps should be aware that if Venus Flytrap seeds are bought, even with a kit, that it will take at least 2 1/2 to 3 years, assuming it is grown correctly, to reach the size of the Venus Flytraps offered in this listing. If you have any questions about this product by JoelsCarnivorousPlants, contact us by completing and submitting the form below. If you are looking for a specif part number, please include it with your message.